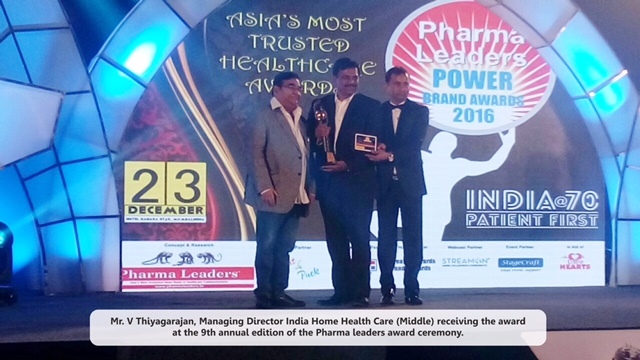 India Home Health Care (IHHC), one of the leading providers of home healthcare services, earned the distinction of “India’s most promising home health care service provider 2016” at the 9th annual edition of the Pharma leaders award ceremony in association with the Ministry of Health & Family Affairs, Government of India. The award was presented by Chief Guest Shri Jagat Prakash Nadda, Hon’ble Union Minister Health and Family Welfare. Having awarded more than 500 top pharma entrepreneurs, medical professionals and research scientists since its inception, Pharma leaders is the only dedicated platform for celebration of excellence in healthcare innovation, pharmaceutical and medical excellence based on outstanding and remarkable contribution to the industry. It is widely acclaimed by industry experts & analysts as a credible award platform known for selecting top leaders through a meticulous methodology & stringent selection process involving research inputs & credible voting procedure by noted eminent juries. India Home Health Care that provides home health care services across various cities like Chennai, Bangalore, Hyderabad and Pune was started as a voice for distressing healthcare situations. Bringing innovation through one point solution for patient care service, IHHC ensures 24 hours patient care at home. Within a short span of time IHHC has emerged as a trusted partner for home health care services to all major hospital groups and the doctor community collaborating with BAYADA Home Health Care. India home health care (IHHC) is India’s leading home health care service provider. IHHC has nurses and caretakers with different expertise levels for Elderly Care, Post-operative Care, Long Term Care, Palliative Care, New born care in Chennai, Bangalore, Pune & Hyderabad and soon in other cities in India. IHHC Elderly Care is package designed for patients of old age. Our nurses care for them like their parents and help them with their dietary habits, health care tips, helping them in walking, bathing, dressing, eating & giving a very good medication and injections as required.